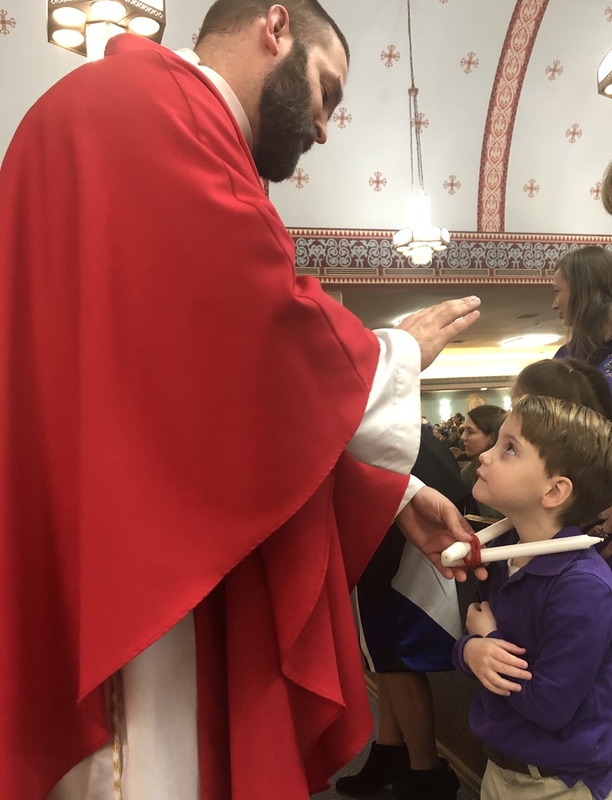 Father Jeff Hebert, Associate Pastor of St. Joseph Church, blesses the throat of Kindergartner Rider Craver during the all-school Mass on February 6. This sacramental is normally performed on the feast day of Saint Blaise of Sebaste which is February 3rd. It was administered again for those who might have missed out. Given the amount of sickness going around, another blessing might have helped. St. Blaise was the bishop of Sebaste in Armenia during the 4th Century and was martyred. It is believed he was a physician before being ordained. Saint Blaise was also reputed to have miraculously cured a little boy who nearly died because of a fishbone in his throat. From the 8th Century on, he has been invoked on behalf of the sick, especially those afflicted with illnesses of the throat. Father Jeff is seen bestowing the blessing with two candles joined together by a red ribbon which is the color of martyrdom. The use of the candles stems from the candles that St. Blaise used while in prison to light his dark cell.